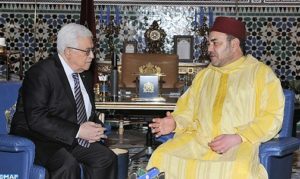 King Mohammed VI of Morocco and Chairman of Al Quds Committee of the Organization of Islamic Cooperation, has renewed his firm commitment to continue defending Al Quds and the Palestinian cause, which are at the core of the Middle East conflict, pointing out that these issues have always been a major concern for him personally and for the whole Moroccan people. This came in a message the Sovereign addressed Thursday to Chairman of the Committee on the Exercise of the Inalienable Rights of the Palestinian People, on the International Day of Solidarity with the Palestinian People, marked on November 29. The issue of Al-Quds has special significance, not only for the Arab and Muslim Ummah – given that the Holy city is home to the blessed Al-Aqsa Mosque – but also for all peace-loving people, given that the city stands for tolerance and inter-faith coexistence, the king pointed out. “Any unilateral actions affecting Al-Quds are both unacceptable and illegal; they represent a serious violation of international law, including United Nations resolutions, Security Council Resolutions 476 and 478 of 1980, and the 2017 “Uniting for Peace” Resolution, adopted by the tenth Emergency Special Session of the United Nations General Assembly,” he said. The King who insisted that the case of Palestine is a central issue in the Middle East and is at the heart of the conflict in the region, underlined that “achieving a just, comprehensive and lasting peace on the basis of the two-state solution and in accordance with Security Council resolutions and the Arab Peace Initiative is a strategic choice – not a political maneuver”. Resolving the Palestinian issue on the basis of the resolutions of international legitimacy would deprive extremist and terrorist groups of their arguments, especially as they have been exploiting the lack of prospects for the settlement of the Palestinian issue and of that of Al-Quds, using this as a pretext to justify their criminal agenda in the region. The Sovereign warned that “the illegal measures taken in Al-Quds might fuel religious sentiment, given the spiritual character of the Holy City, with the potential risk of turning a political conflict into a religious one”. “This would be extremely dangerous for global peace and security and for the desired harmony and coexistence between different cultures and civilizations,” he insisted. King Mohammed VI argued that the Palestinian struggle for freedom and independence and for the establishment of an independent Palestinian state, with East Jerusalem as its capital, has lasted all these years due to “the lack of justice, to widespread frustration and to the suffering caused by occupation and injustice”. For him, the greatest challenge facing the international community is the implementation of the internationally-backed resolutions supporting the Palestinian cause. The King deplored the suffering of the Palestinian people in the Gaza Strip, which has been submitted to an unjust blockade for years, underlining that Morocco has spared no effort to assist the Palestinians and alleviate their difficult circumstances. He recalled in this connection that he had ordered the airlift of medical and food aid to Gaza in 2009 and 2014 and during the holy month of Ramadan this year, he personally supervised the launching of a humanitarian initiative for the benefit of the Gaza Strip, which was later expanded to include Al-Quds Al-Sharif and Ramallah. He also recalled that the Moroccan Royal Armed Forces have set up a field hospital in the Gaza Strip, offering a range of medical specialties, such as pediatrics, orthopedics, gastroenterology, ophthalmology and otorhinolaryngology to the local inhabitants. The King touched on the initiatives he conducts as Chairman of Al Quds Committee, saying these actions build on political and diplomatic endeavors at the bilateral level, in international forums and through fieldwork carried out by Bayt Mal Al-Quds al-Shareef Agency. “This operational mechanism affiliated with the Al-Quds Committee acts under my personal supervision and carries out concrete projects and plans in the areas of housing, healthcare, education and social services for the benefit of the inhabitants of Al-Quds. These projects are aimed at safeguarding the cultural identity of the Holy City, improving the social and living conditions of the inhabitants of Al-Quds, supporting their struggle and encouraging them to remain in the Holy City,” the king stated. In his message, the King also talked about the divisions marring inter-Palestinian relations, calling on the Palestinians to end this state of division and to engage resolutely and in good faith in forming a national unity government. Such a unity government would have to shoulder its responsibilities towards the Palestinian people and serve as the sole interlocutor, enjoying high credibility with the international community, in order to put an end to the suffering of the Palestinian people and to the injustice weighing on them. “Today, the Kingdom of Morocco is renewing its call for the reactivation of the reconciliation agreement and for the national unity government to be able to extend its mandate over all Palestinian territories in order to serve the Palestinian national project”. Written by: Jaber Ali on November 30, 2018. Posted by Jaber Ali on Nov 30 2018. Filed under Headlines, World News. You can follow any responses to this entry through the RSS 2.0. Both comments and pings are currently closed.